Learn more about plumbing pipes and fixtures. Introduction to Plumbing Pipes and Fixtures is a vocational course designed for anyone wanting to learn more about plumbing. This course is the third in the series of plumbing courses. While the first two introduced the learner to the trade and plumbing tools and drawings, this course goes a step further. For a building to be considered habitable, it has to be connected to the main water and gas supply systems, and have appropriate provisions for handling waste water. The installation of long-lasting plumbing pipes ensures that these basic requirements are met. In this free online course, various materials such as plastic, copper, cast iron, carbon steel, and CSST that are used to make pipes and fixtures are discussed. Besides this, the course covers the terms associated with plumbing pipes, the differences between fittings and valves, the tests carried out on plumbing and gas pipes to ensure they are leak-proof, and the basic principles of sanitation and safety. 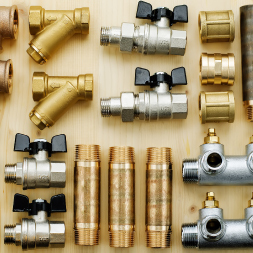 This course will be of great interest to construction professionals who want to deepen their existing knowledge on plumbing: identify the properties as well as the advantages and the disadvantages of working with different piping materials. It will also be of interest to all learners who want to learn about the different types of pipes and fixtures that are in use today. Having completed this course the learner will be able to: - Describe the various types of material used to make plumbing pipes and fixtures; - Explain the advantages and the disadvantages of plastic, copper, cast iron, carbon steel, and CSST used for plumbing pipes and fittings; - Discuss the terms associated with plumbing pipes and fittings; - Identify the tests carried out to check pipes used in drainage and vent systems; - State the basic difference between fittings and valves; - Distinguish between a plumbing fixture and a faucet; - List the purposes of using pipe hangers and supports; - Discuss the basic principles of sanitation and safety.